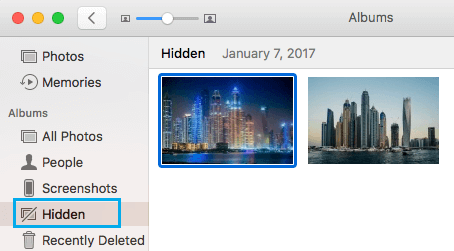 While there is no foolproof way to hide Photos on Mac, there is a simple way that prevents hidden photos from being visible when you are showing your Photos to someone. 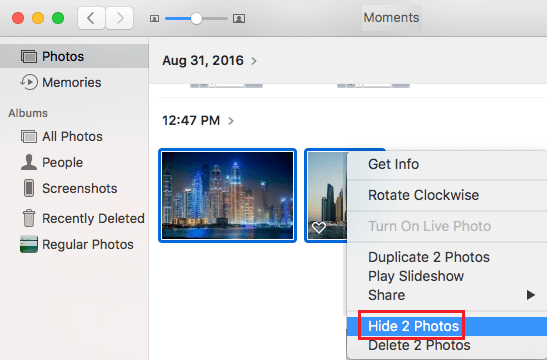 Let us take a look at how to hide Photos on Mac. The Photos app on your Mac, allows you to store, manage, edit, view and show your photos to others. 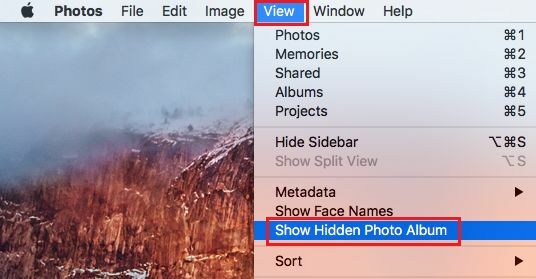 The Photos App also has a Hide Photos Option that allows you to Hide Photos that you do not want to be viewed by others. Basically, the Hide Photos option moves Photos that you want to Hide to a separate folder and makes sure that hidden Photos do not appear will you are showing photos to anyone in Moments, Collection, Years and Memories section of the Photos App. Unfortunately, there is no way (as yet) to password protect the Hidden Folder or any other effective way to prevent anyone from gaining access to the Hidden Photos Folder on your Mac. 1. Open the Photos app on your Mac by clicking on the Photos App icon in the Dock. 2. Next, find the photo that you want to hide. 3. Right-click on the Photo that you want to hide and then click on Hide Photo option in the menu that appears. 4. You will see a pop-up, click on the Hide Photo button to confirm your action. You will immediately see the photo disappearing and it will not appear in Moments, Collections, Years and Memories section of the Photos app. 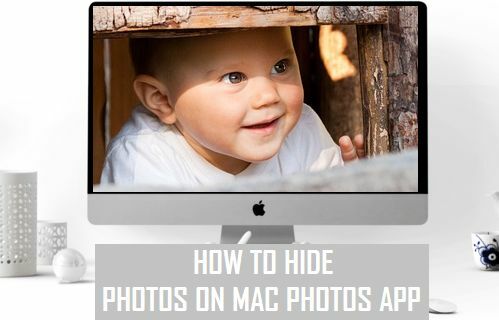 Follow the steps below, in case you have multiple photos that you want to hide on your Mac. 1. Open the Photos app on your Mac. 3. After you have selected all the Photos, right-click and select the Hide Photos option that comes up in the menu. 4. You will see a pop-up, click on the Hide Photos button to confirm your action. 2. Next, click on the View option in the top menu-bar on your Mac and then click on Show Hidden Photo Album option in the drop-down menu. 3. Back on the Photos app, you will see the Hidden Folder in the left sidebar menu. Click on the Hidden Folder to see all your hidden Photos. 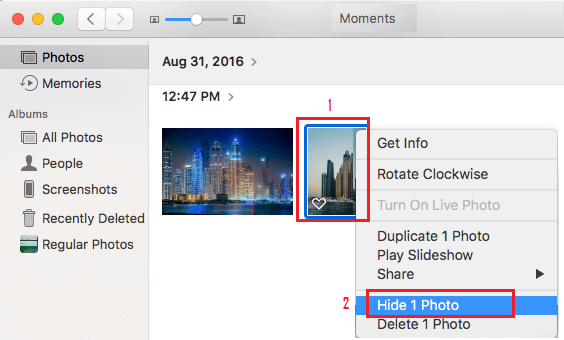 At any time you can unhide the Photos on your Mac by following the steps below. 2. Next, click on the Hidden option in the Left-Sidebar Menu to reveal all your Hidden Photos on Mac. 3. Right click on the photo that you want to unhide and then click on the Unhide Photo option in the menu that appears. In case you have multiple Photos to unhide, select all the photos that you want to hide, right click and choose the Unhide Photos option in the little Menu that appears. 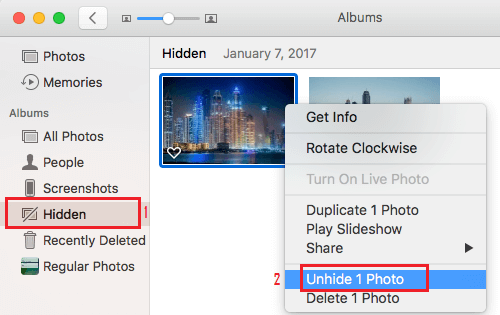 As mentioned above, the option to Hide Photos on Mac is not foolproof, it only provides you with a way to prevent hidden photos from appearing during the regular use of the Photos App.